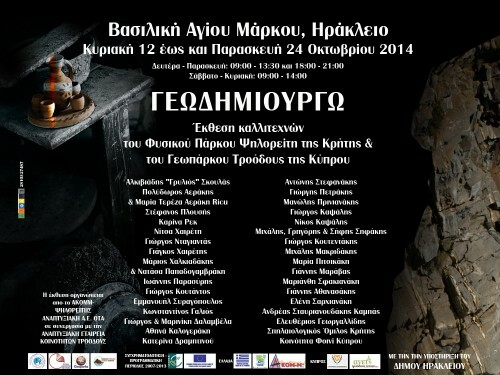 An Art Exhibition of artists that origin from two unique but relative places of the Mediterranean Sea namely the Psiloritis Natural Park on Crete and the Troodos Geopark in Cyprus. At the exhibition the work from folklore artists as well as from modern artists, all with different backgrouns, is commonly presented. Either by using material from their regions or by being inspired from the natural landscape, the history, the tradition, and the everyday life as they experience it in their regions, they present us their creations. The exhibition is organized at the framework of the interregional cooperation GEOPRODUCTS from the ΑΚΟΜΜ-PSILORITIS DEVELOPMENT AGENCΥ OF LOCAL GOVERNMENT and the DEVELOPMENT AGENCY FOR THE COMMUNITIES OF THE TROODOS AREΑ. The region of Psiloritis on Crete and the region of Troodos in Cyprus have both common characteristics and peculiarities. Both regions build their spatial competiveness through their overall environmental, cultural and human asset, by creating sustainable services of alternative kinds of tourism as well as local high quality products. Attempting to promote their environmental and cultural heritage, the two regions with the management and care of their developmental agencies, aim to advance developing mechanisms of high value such as the Geoparks and the Geotourism. The region of Psiloritis features the PSILORITIS NATURAL PARK Geopark which was established in 2002 under the initiative of ΑΚΟΜΜ-PSILORITIS DEVELOPMENT AGENCΥ OF LOCAL GOVERNMENT with the scientific support of the Natural History Museum of Crete. This region was instantaneously registered in the European Geoparks Network and after a while at the Global Geoparks Network of UNESCO. At present time the two regions, with the aid of ΑΚΟΜΜ-PSILORITIS DEVELOPMENT AGENCΥ OF LOCAL GOVERNMENT and DEVELOPMENT AGENCY FOR THE COMMUNITIES OF THE TROODOS AREΑ respectively, apply their LEADER funds and they implement a common interregional programme called “Geoproducts”. The programme has set as a strategic target the connection of Earth with the cultivated products and services of the two regions of Psiloritis and Troodos. Both partners believe that the products and services developed within their regions feature the added value given by their environment and culture. One among the many objectives of the programme is the promotion of the cultural heritage of the two Geoparks through the implementation of relative activities. The Local Artists Exhibition from the Psiloritis Natural Park on Crete & from the Troodos Geopark in Cyprus titled “GEOCREATING” aims to present the constant interaction between man and nature namely how the art of humans is affected from their region as well as from the Earth’s materials, like stone, wood, clay that she freely offers, which obtain shape and soul. Through this process nature, art and visual creation are getting integrated in symphonic harmony. With great pleasure and sense of gratitude, I send greetings through this site, concerning the collaborative project called “Geoproducts”, which we implement with the Development Company of Psiloritis. Cooperation between Crete and Cyprus is always bliss. Especially now, between the two proud mountains the cooperation is fascinating revealing a mixture of common culture. Common pride and love for the land and people of the toil who’s the sweat irrigates the rich land and then the land returns to people life through food, love, music art and wisdom. Our land, the land of Troodos and Psiloritis, grows people with great zeal for life and creativity, hard workers with acts of everyday life based in dignity, imposed by the law of nature. The elements of air, water, soil and sun, the elements of nature, gives us inspiration for artistic creation: A humble magnificence in everything that is created by their hands, whether it's about the food or tools of everyday life and above all the spirituality that translates into great artwork. The nature, the land gives people inwardness and spirited mood. The result is what presented within this site. Congratulations to everyone for this initiative. We hope you find the work produced from this collaboration useful. The only certainty is that the connection between man and the earth has to give us great ideas for future business opportunities and survival methods. But mainly self-reliance and independence from foreign elements that make us vulnerable to the antics of the times. Psiloritis Natural Park was founded in 2001 from the developmental body of the region “AKOMM – Psiloritis Development Agency SA Organization of Local Government” with the scientific support of the Natural History Museum of the University of Crete. Its establishment contributes to the strategic goal of the local authorities which is the creation of the appropriate economic and social conditions, aiming to embed the cultural and environmental added value of the region to the products and services of Psiloritis. The Park covers a surface area of 1200 km2 approximately embraces the mountainous region of Idi Mountain (Psiloritis), the valley of Mylopotamos and the Tallaia Mountain (Kouloukonas), while it extends until the north coast of Crete. Due to its rich geo-diversity, the beautiful landscape and the undoubted history and tradition, Psiloritis Natural Park entered to both the “European Geoparks Network” and the “Global Geoparks Network assisted by UNESCO”, having obtained universal recognition. Today, Psiloritis Natural Park has an active role to the global efforts for the protection and promotion of the environment and of the geo-scientific and cultural heritage, as well as to the sustainable development of the local communities through alternative kinds of tourism and education. Administratively, the area forms part of three districts – Nicosia, Paphos and Limassol - and covers the altitude from 300 meters to the highest peak, Mount Olympus, which stands at 1,952m above sea level. It includes 110 communities with a total population of approximately 25,000 residents. The formation of Cyprus is directly linked to the creation of the Troodos mountain range, as a result of a series of unique and complex geological processes which have made Cyprus a geological model for researchers from around the world, contributing to a better understanding of the development of the oceans and of the planet in general. Neither the residents of Cyprus nor the island's foreign visitors would ever suspect that the wooded peak of Troodos is actually the deepest layer of a section of oceanic crust and the Earth's upper mantle. In other words, an ophiolite complex that was formed 90 million years ago, 8,000 metres below sea level. The region combines enormous geological interest with the unique natural environment of Troodos, a long history of human settlements and the population’s local customs and traditions. Psiloritis Natural Park and Troodos Geopark would like to thank the MUNICIPALITY of HERAKLION for hosting the exhibition at the Basilica of Saint Marcus, as well as the participant artists for contributing their work for exhibition.